Investing in new outdoor power equipment should require an extensive research and a hands-on buying experience. Don’t you agree? After all you’re spending your hard earned money on a powerful equipment! 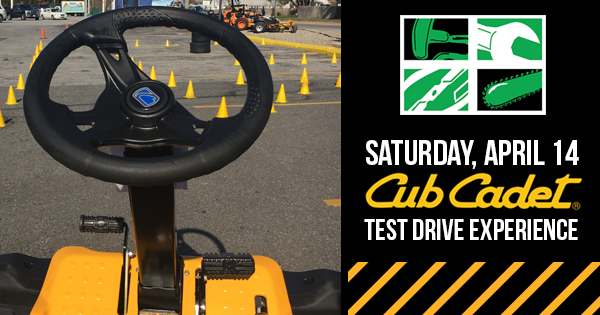 What if we told you that at Suburban Lawn Equipment, you get to test drive a Cub Cadet Lawnmower before you purchase it? Just stop by our shop in Wilmington, Delaware (1950 W Newport Pike) this Saturday, April 14, 2018 from 8 am to 3 pm. If you are not sure which Cub Cadet product is right for your needs, we will have factory sales rep on site to answer all your questions. As always, we want you to have the right Cub Cadet product for the right job! Besides a guaranteed fun Cub Cadet Test Drive Experience with Suburban Lawn Equipment, we also offer special financing and refreshments! A WDSD DJ will be there too! This entry was posted in Commercial Lawn Equipment, commercial outdoor equipment, Cub Cadet Lawn Mowers, Cub Cadet Test Drive, landscaping business, lawn care, Lawn Mowers, Outdoor Power Equipment and tagged commercial outdoor equipment, Cub Cadet, cub cadet dealer, cub cadet delaware, cub cadet lawn mowers delaware, cub cadet test drive, Outdoor Power Equipment Delaware, Outdoor Power Equipment Needs on April 10, 2018 by Suburban.